The launch of the iPhone 8 has been awaited with bated breath, and this time around there have been rather more leaks than normal. We've not only seen suggestions of what the new phone will look like, but also heard strong rumors about features such as wireless charging and Face ID 3D facial detection. What we have not known for sure is just when Apple will reveal all. Now the wait is over. 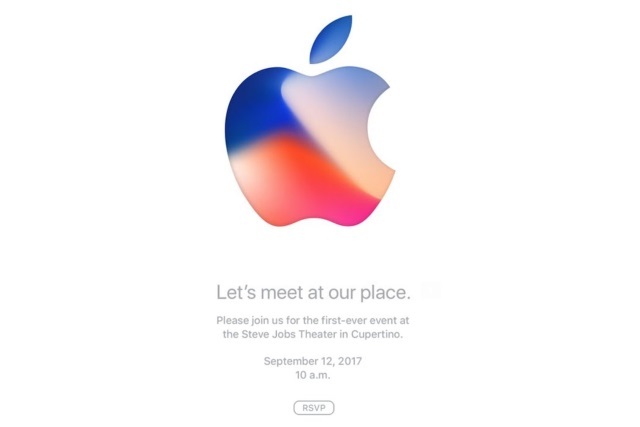 The company has just sent out invites to an event to be held at the Steve Job Center in Cupertino ("let's meet at our place"). The date: September 12. The time: 10am. On the agenda: iPhone 8, iPhone 7s, iOS 11 and more. Of course, Apple would never be so dull as to actually confirm that it is going to reveal the phone everyone (all but) knows it is going to reveal. That's what a normal company would do. Despite launch news being pretty much out in the open now, Apple is choosing to play it coy, pretending it's all going to be a big surprise on the day. In addition to the iPhone 8, we should hear about the iPhone 7s and iPhone 7s Plus. On the hardware front, there's also likely to be news about the third generation Apple Watch complete with LTE connectivity, and the fifth generation Apple TV with 4K support. On the software front, we'll hear about the final versions of iOS 11, macOS 10.13, watchOS 4, and tvOS 11.